How Much Sugar Won't Spike Insulin? Excess body fat, especially around your middle, is linked to health conditions including type-2 diabetes, certain cancers, stroke, hypertension, heart disease and reproductive problems. To gauge whether you're susceptible to any of these health risks, determine how much body fat you have. 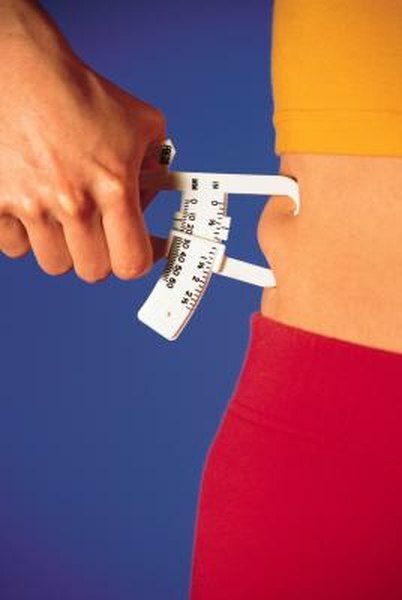 Obtaining your body fat percentage is easily done with store-bought, handheld calipers or electrical impedance meters. Once you have your body fat percentage, determining how much your body fat actually weighs is simple. Obtain your overall weight by standing on a scale. For the most accurate results, get on the scale first thing in the morning before you've had anything to eat. Use a body fat analyzer or caliper to calculate your current body fat percentage. They will both require your age, gender and height for an accurate estimate of total body fat. Multiply your scale weight by your body fat percentage. For instance, assume you weigh 180 lb. and your body fat percentage is 25 percent. Multiply 180 and 0.25 to get a total of 45 lb. of total body fat. Measure your waist circumference for a quick gauge whether you're at risk of health conditions. If it's 35 inches or more, you're at an increased risk.